Designed by Daryl Halligan - Goal kicking Coach known as the 'Super Boot!'. Halligan first kicked a world of 30 consecutive goalkicks. In the year 2000 he became the first player to score more than 2000 points in the NRL premiership. 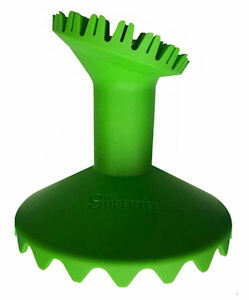 Whilst using the Supertee Halligan's kicking average exceeded 85%. The tapered teeth technology creates ZERO FRICTION This kicking tee is made from soft rubber, making it very durable. From the central point of the top of the top of the tee to the base measures 11cm.